Water, Citric Acid, Natural & Artificial Flavors, Sucralose, Acesulfame Potassium, FD&C Yellow #6. Consume one bottle (10 fl oz) of C4 ON THE GO 20-30 minutes before dominating exercise...and life. Some individuals may experience a harmless tingling sensation, which is attributed to beta alanine. THIS PRODUCT IS ONLY INTENDED TO BE CONSUMED BY HEALTHY ADULTS, 18 YEARS OF AGE OR OLDER. Do not use this product if you are pregnant, nursing, or are currently taking nitrates for chest pain or if you are taking medication used to treat erectile dysfunction such as PDE-5 inhibitors. Before using this product, consult a licensed, qualified, health care professional, including but not limited to, if: you are taking antidepressants such as a MAOI (Monoamine Oxidase Inhibitor) or SSRI, blood thinners, nonsteroidal anti-inflammatory drugs, pseudoephedrine, or you are taking any other dietary supplement, prescription drug or over-the-counter medication; or if, you suspect you have or have been treated for, diagnosed with or have a family history of, any medical condition, including but not limited to: high or low blood pressure, diabetes, glaucoma, anxiety, cardiovascular, psychiatric or seizure disorders, cardiac arrhythmia, stroke, heart, liver, kidney or thyroid disease, or difficulty urinating due to prostate enlargement. Discontinue use 2 weeks prior to surgery. Immediately discontinue use and contact a medical doctor if you experience any adverse reaction to this product. Do not use if safety seal is broken or missing. Store in a cool dry place. Do not Freeze. KEEP OUT OF REACH OF CHILDREN. Carbonated Water, Citric Acid, Natural & Artificial Flavors, Potassium Sorbate (preservative), Sucralose, Acesulfame Potassium. Carbonated Water, Potassium Sorbate, Citric Acid, Sucralose, Tartaric acid, Natural & Artificial Flavors, Acesulfame Potassium, FD&C Red #40, FD&C Blue #1. Water, Citric Acid, Potassium Sorbate, Sucralose, Acesulfame Potassium, Natural & Artificial Flavors, FD&C Red #40. Water, Citric Acid, Potassium Sorbate, Natural & Artificial Flavors, Sucralose, Acesulfame Potassium, FD&C Yellow #6. Water, Citric Acid, Natural & Artificial Flavors, Potassium Sorbate, Sucralose, Acesulfame Potassium, FD&C Yellow #5, FD&C Blue #1. Finally, Cellucor listened and removed the artificial colors for the new Grape Frost flavor! Watch Mike and Matt review it at the gym! 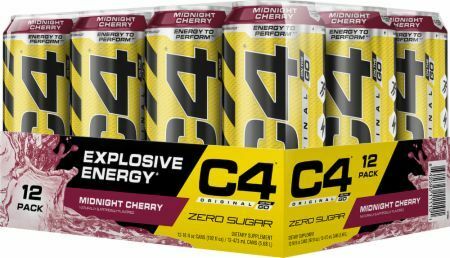 Apr 18, 2018 Cellucor C4 in a Can.. Is it an Energy Drink or Pre Workout?! Sep 23, 2015 Cellucor C4 on the Go – C4 Ready to Drink Bottles!